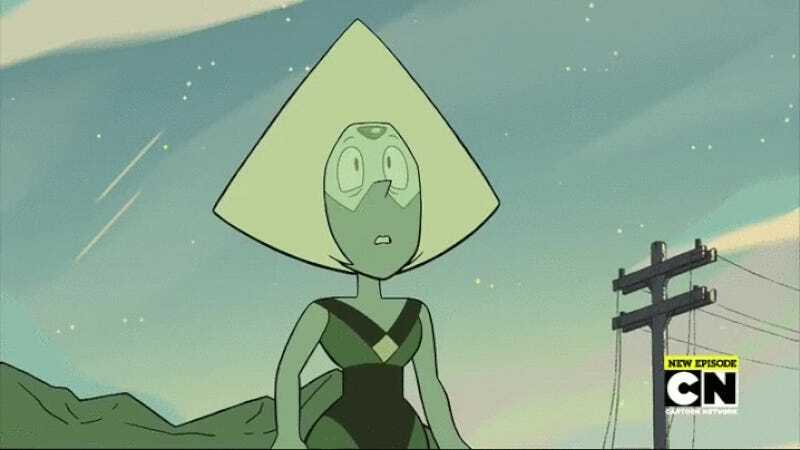 Ever since Peridot entered a tentative alliance with the Crystal Gems, the question of just what would happen to her has been on the lips of Steven Universe fans. Would she betray them? Join them? Well, whether she wanted to or not, Peridot made a decision in “Message Received” that changes Steven Universe in some huge ways. “Message Received” pretty much reruns the whole gamut of Peridot’s short emotional arc on the show—following on immediately from “It Could’ve Been Great” we get to see her back to her scheming ways behind the backs of the Crystal Gems and Steven, fully believing that they don’t stand a chance when aid from the Gem Homeworld (and Peridot’s boss, Yellow Diamond) against the Cluster would. She reverts even further back into her maniacally cackling villain role when she goes on the run, attempting to contact Homeworld. All of this is little surprise to the Gems, except for Steven who is understandably hurt at his trust being used, but also because he thinks he failed in doing something good: convincing Peridot to change her mind and see the good in what the Crystal Gems do. It’s touching that his anger at Peridot quickly turns into regret rather than a desire for revenge. It makes Peridot’s ultimate decision when she does contact Yellow Diamond all the more sweeter, because it turns out Steven did get through to her—not just because Peridot eventually defies Yellow Diamond (in her own spectacular way, right down to a righteous yell of “YOU CLOD! !”), but because Peridot only contacted Yellow Diamond to try and reason with her, not to betray Steven or attack her. It’s a huge new chapter for Peridot, and for the show; the Gems have now drawn the direct ire of Homeworld, and it’s a decision that’s going to have some big consequences sooner rather than later. So yes, Peridot is a Crystal Gem now, whether she likes it or not, as Garnet says at the end. But it turns out that, thanks to Steven’s influence, she’s really been one for quite a bit longer.